Laser surgery is an important alternative and adjunct to medicines and traditional surgery for many conditions. We offer a variety of outpatient laser surgical procedures, many of which are performed in our office using only topical anesthesia with eye drops. We perform laser surgical procedures in our office using an argon laser. 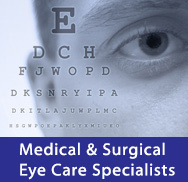 We currently offer argon laser trabeculoplasty(ALT) and peripheral laser iridectomy for various types of glaucoma. We also offer focal laser photocoagulation to treat retinal swelling associated with diabetes as well panretinal photocoagulation for more advanced forms of diabetic retinopathy. The argon laser is also used to treat small retinal tears often associated with vitreous detachment and floaters to prevent retinal detachment. Our doctors also perform posterior capsulotomy using a YAG laser to remove the hazy membrane and subsequent clouding of vision that may occur on the back of the lens implant months to years after cataract surgery.